Is Realogy's portal an innovation or smoke bomb? Now that Realogy’s portal, homesforsale.com, is live, one big question is up in the air: Is this new arrival on the market an innovation bomb … or is it more of a smoke bomb, a temporary distraction that simply won’t last? 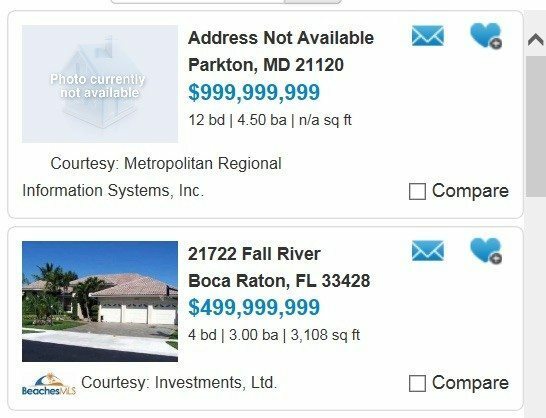 Realogy’s portal has got a clean, almost minimalist design, but the slogan “all the homes, none of the games” has zero benefit to sellers or buyers. A slogan should pierce the market’s greatest desire, differentiate your offering in the marketplace — and, hopefully, be memorable. Instead, Realogy seemed so focused on Zillow Group, and perhaps at trying to impress their agents, that their tagline must target these two demographics. Within six weeks, they will remove it and place a politically correct, committee-approved, generic-house-site-type slogan. No innovation bomb here. The URL “homesforsale” is well-chosen from a search engine optimization (SEO) perspective — as in, “homes for sale in New York,” etc. If Realogy gets some solid articles and information pertaining to each metro area where it operates, the search engines will probably migrate this site toward the top of the search results list within 30 days. The “home” link in the header menu is quite old-fashioned, especially since the logo does the same thing. I tried using the big search box for my hometown, Denver, Colorado, and saw the popup below. You won’t see that notification on Zillow. No innovation bomb here. Scrolling down a bit, I saw this graphic promising “better, fresher information.” What is that symbol? 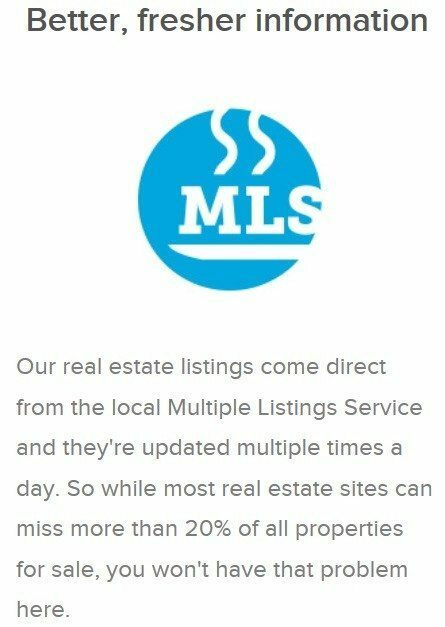 A steamy, fresh pile of … MLS (multiple listing service) information? 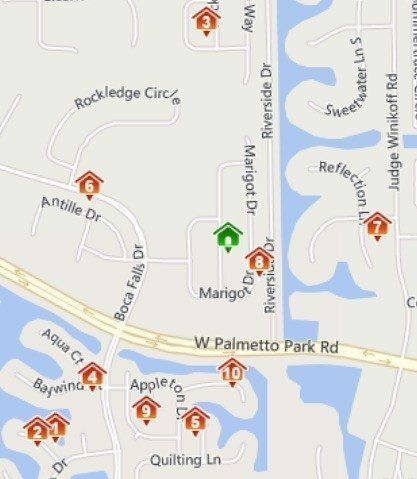 Instead, Realogy should have created a cool icon — “new homes added every 15 minutes” — rather than advertise the fact that the listings come from the local MLS and are updated multiple times a day.” Is Realogy’s accountant writing prose for the site? No innovation bomb here. I didn’t even know what the next symbol was. 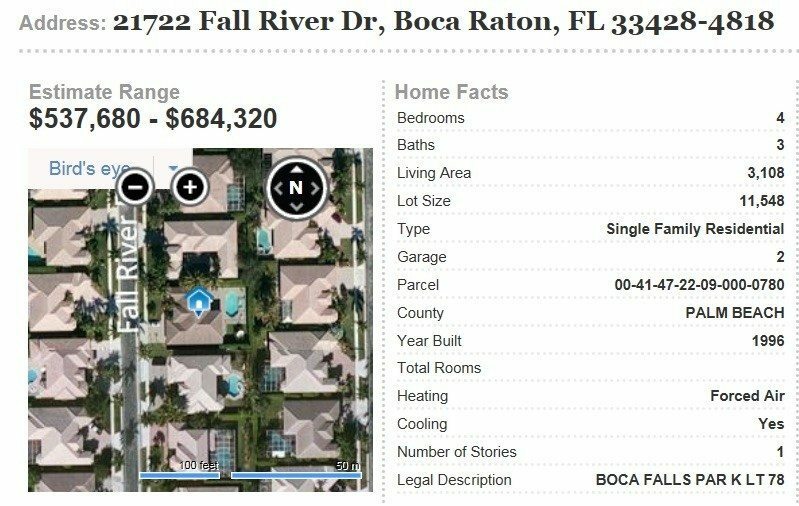 And an automated valuation model (AVM) and sold comparable listings (comps) were “insider information” … about 10 years ago. Here is the question that will emerge in the minds of homebuyers and sellers when they read the the statement that ends with “… the insider information that’s normally reserved for real estate pros.” If they have what we have, why do they need us? No innovation bomb here. 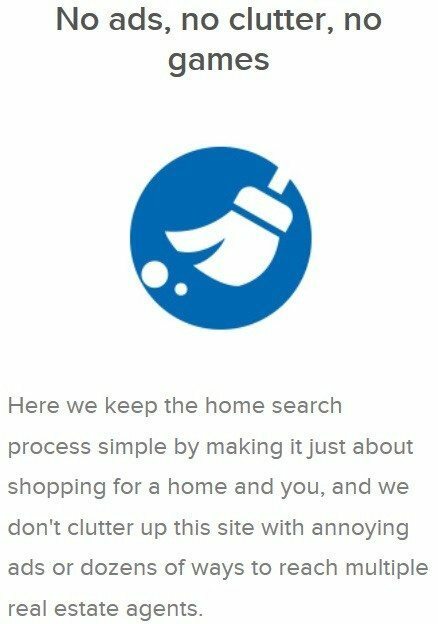 Then they clutter up their site by bragging about how there’s no clutter. Just stay clean and lean; the market will notice that without you drawing attention to it. You don’t see Disneyland bragging about the 5,000 people working endlessly to keep the amusement park pristine — it just happens, and the visitors do notice how perfect everything is all the time. 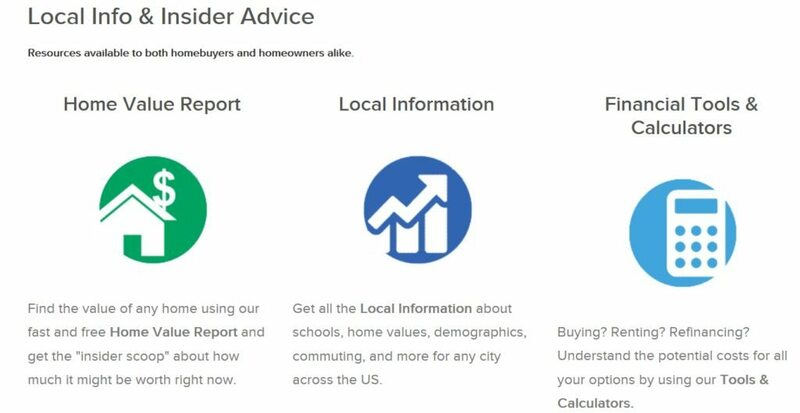 I had to click the “local info and insider advice” link. Wow, it’s “available to both homebuyers and homeowners alike.” Good thing, as it may be hard to tell which I am from this side of the Internet. No innovation bomb here. The search tools are standard IDX (Internet data exchange)-style stuff: price, number of beds, number of baths, property type and lot size parameters. No innovation bomb here. I decided to do a map-based search and just stared at the default homes that opened up. Nice — a home for just under $1 billion, in Maryland, with no address and only 4.5 baths, and the taxes are only $2,463 (see, the rich just keep getting richer and pay almost no taxes). I was too scared to hit the “payment calculator” tool: I’ll just have to keep it on my “maybe” list. Then I checked out the second property above; it’s only half a billion dollars, much closer to my budget than the first one. The listing includes pretty standard IDX details with a little enhancement. I tried and tried but could not discover the instant valuation I was expecting — you know, the “secret insider” stuff bragged about on the home page. I did come across a “recently sold properties” tab and tried that. I don’t think these are all actually comparable to my half-billion-dollar home. They ranged in value from $312,000 to $652,000, not even close to $499,999,999. The map showed the comps on the other side of the main roads — maybe some of these are in a swamp; I don’t know. There’s a lot of blue stuff — water all around? No innovation bomb here. Where is my elusive automatic valuation? 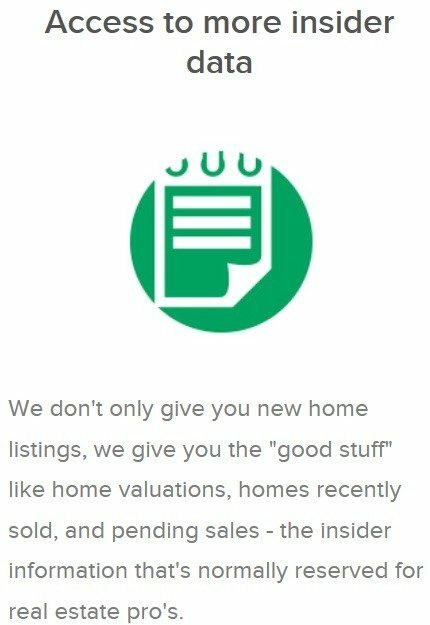 I had to jump back to the header menu for the insider information, then follow another link promising a “home value report,” then paste in the full address, and below is what I got. The valuation came in at $537,680 to $684,320. So that means if I can get an 80 percent loan on $600,000 (that would be $480,000), then my down payment will be about $499,879,999. I’ll do it! 1. Can you create breakthrough technology instead of incremental improvements? Not here. 3. Are you starting with a big share of a small market? No; a miniscule share of a big market. 4. Do you have the right team? Not based on the form and function of this website. 5. Do you have a way to not just create but deliver your product? Yes — zillions of brokers paying a 35 percent referral fee to serve clients. No innovation bomb here, though. 7. Have you identified a unique opportunity that others don’t see? Only if you rip the eyes out of Zillow, Trulia, realtor.com and every IDX site provider and AVM producer on the planet. Sorry, the new Realogy site gets a “smoke bomb” rating. Creed Smith is living the creation and implementation of innovation via QValue.net and DemonOfMarketing.com.